Scintillator materials inside most radiation detectors are very expensive to produce and maintain and should be operated at low temperatures and in airtight enclosures. Since detectors play critical roles in many scientific and technological applications, research efforts are geared towards identifying better alternatives to circumvent the industrial challenges and to develop more affordable and efficient radiation detectors. We then investigate the potential of hydrothermal-grown zinc oxide (ZnO) nanorods as scintillator materials for radiation detectors. Vertically aligned ZnO nanorods with 1.24 to 2.34 μm lengths and 27 to 146 nm widths were successfully fabricated using the hydrothermal growth method. Under ultraviolet (290 nm) excitation, the hexagonal nanorods exhibit intense room temperature emissions at 382 nm with lifetimes ranging from 24 to 120 ps. These emission lifetimes are faster than those of conventional Ce:YAG scintillators (50 to 70 ns) and are comparable to those of intentionally doped ZnO bulk crystals (15 to 130 ps). Aside from having fast emission lifetimes, the ZnO nanorods can also function as light couplers which efficiently guide their own scintillation photons towards the detector’s readout device. Hence, our investigations may pave the way to the accelerated development of radiation detectors which are based on high-quality nanostructures such as the hydrothermal-grown ZnO nanorods. Melvin Empizo obtained his MS Physics degree from the University of the Philippines Diliman in 2012 and his PhD degree in Engineering from Osaka University in 2016. Shortly thereafter he became a Specially Appointed Researcher and then a Specially Appointed Assistant Professor of the Osaka University Institute of Laser Engineering. His present research activities include investigations of oxide and fluoride bulk crystals, glasses, and nanostructures, as well as their potential laser and scintillator applications. He is also actively engaged in the promotion of Osaka University's international joint research programs by organizing collaborative research activities and bilateral student and faculty visits. M. Empizo. 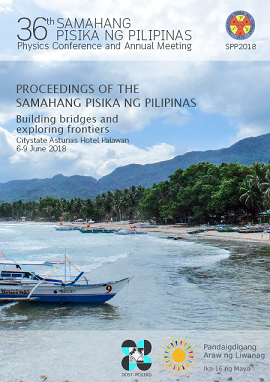 Scintillator applications of hydrothermal-grown ZnO nanorods, Proceedings of the Samahang Pisika ng Pilipinas 36, SPP-2018-INV-1G-01 (2018). URL: https://paperview.spp-online.org/proceedings/article/view/SPP-2018-INV-1G-01.